I wonder who first named the garland. To me, the word "Gar-Land" sounds like a fantastical place abounding with schools of shimmering gar fishes and pretty-flowy-hanging-things. It certainly doesn't sound like the pretty-flowy-hanging-thing itself... Language is funny, isn't it? What I meant to say was: I made a garland. Would you like to see how? As you've no doubt gathered, it's as simple as Simon to make. But, you know, since you're here... Here's what I did! Cut your cereal box into twine. 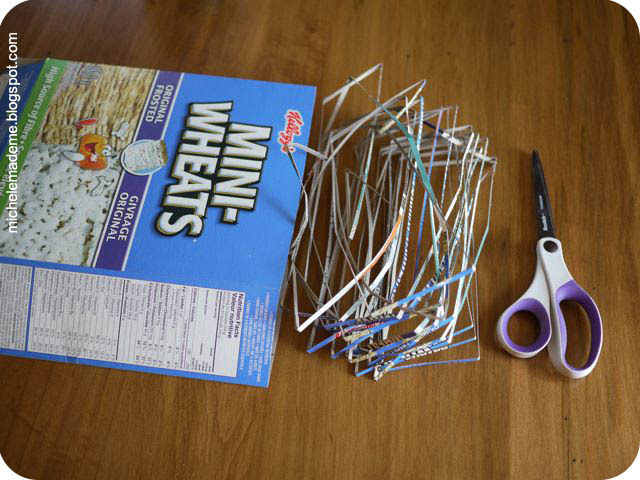 Do this by cutting a continuous strip all around the box, turning the box over and over until you get a whole lot of cereal box "twine". 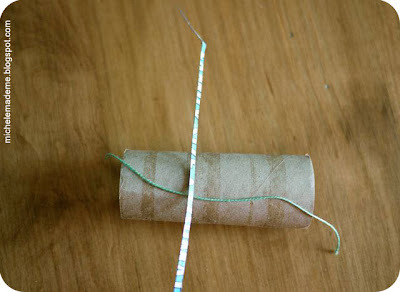 Now take your toilet roll and a piece of string. 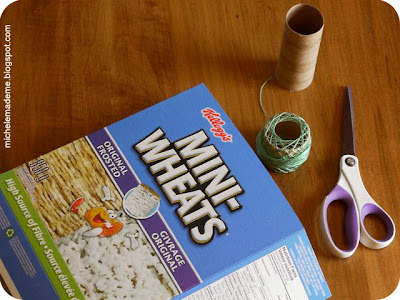 Place the piece of string along the tube with the cereal box twine laying across it. Like so. Holding your string in place, wind the twine several times around the toilet roll. Tie a knot around the twine with the string. 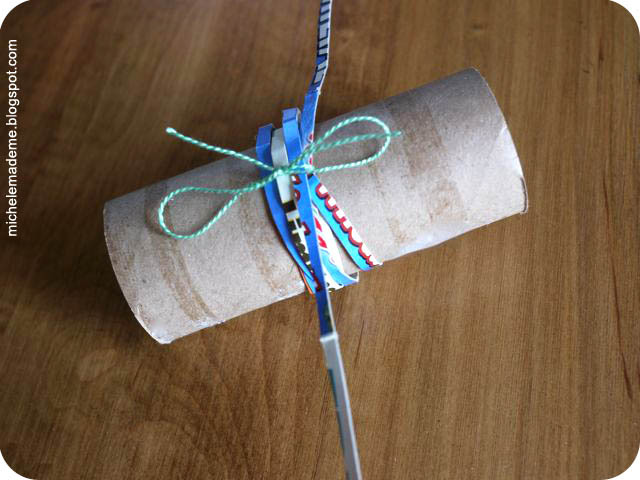 Make a bow. 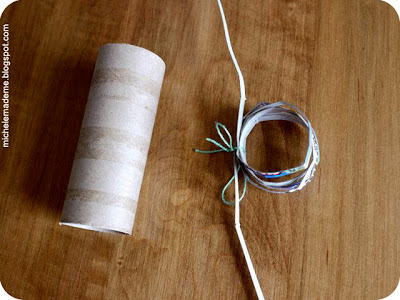 Slip the twine loop off the toilet roll. Repeat many many times. Until you have a sizable garland. 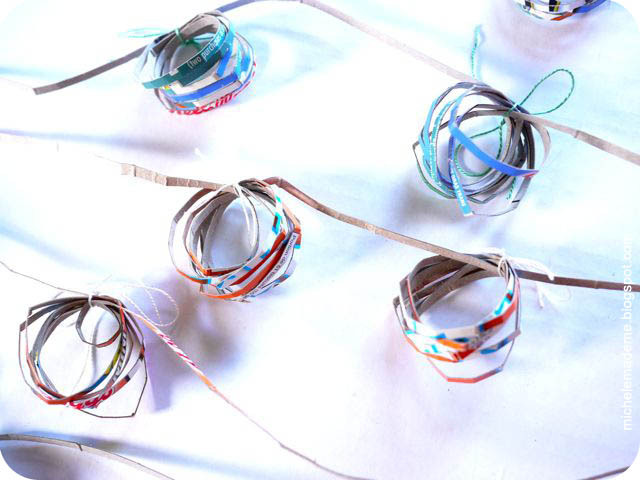 For a whole collection of me-made garlands, click here and here. And here. And um... here. And again here. 'Twould appear I live in GarLand. Have a glorious day, and I'll see you again on Friday! 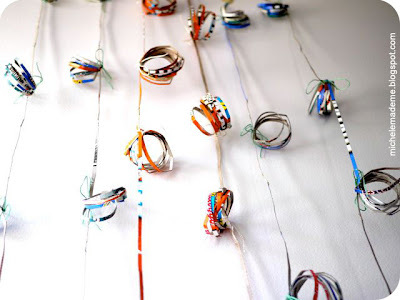 You come up with the funnest things to do with recyclables. I love it. This is lovely and so easy to make! Thank you for sharing Michele! Again, you, with the genius ideas! These are so keen and colorful. For some reason I'm reading them as having some African flair. Is that just me? It's probably just me. Either way, these are the bees knees. I want an excuse to hang them from every corner of the room! Pretty. I like how light and airy they look. Love it! Yep, that about sums it up. 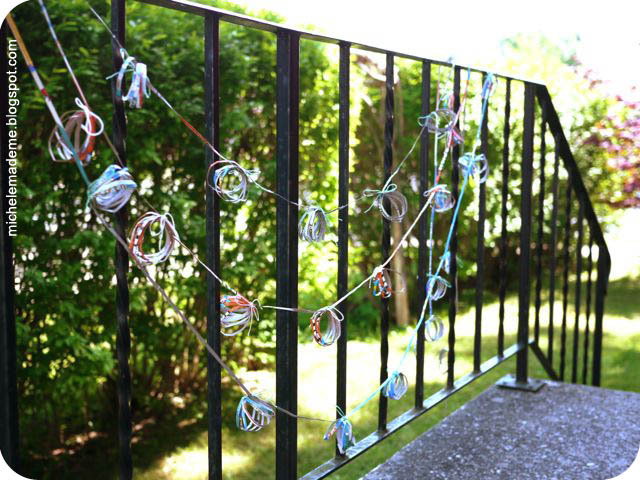 This looks so pretty hanging on the railing outside. 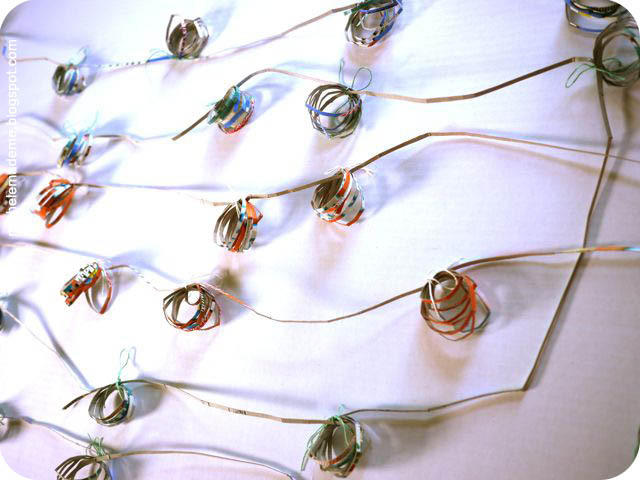 Another lovely garland, Michele. this is amazing!!! LOVE THIS! 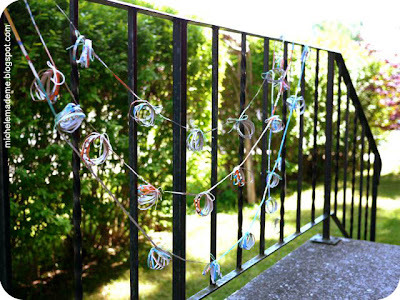 and all of your other garland ideas! Wow, you are so inspiring :) thank you for posting! Also, thank you for sharing the tutorial. I will be giving this one a try!